Jim is a retired geologist, born in Wheeling, West Virginia and now living in Waynesboro, Virginia. He is the father of three grown sons. After more than fifty-five years of marriage, his wife Jaquelin died in 2006. 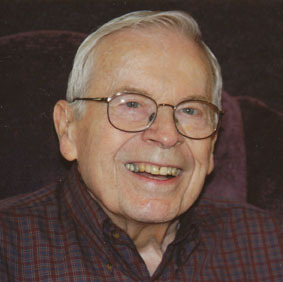 The first half of his career, mostly with the U.S. Geological Survey, was devoted to applications of earth sciences in solving military problems. He had extended field assignments in Alaska, Svalbard (Norway), Germany, Iran, and Vietnam. He also held a variety of research, editorial, and managerial positions. His later career was in environmental geology. He managed a program of environmental resource inventories for the civil works programs of the U.S. Army Corps of Engineers. Returning to the Geological Survey, he was involved in the environmental impact analysis of various mineral developments on the public lands and the outer continental shelf. He retired as chief of the Survey’s office of environmental affairs. For several years following retirement, Jim was a member and exhibiting artist in the Enamelists Gallery at the Torpedo Factory Art Center in Alexandria, Virginia. He later served 3½ years as a Court-Appointed Special Advocate (CASA) assisting abused and neglected children in Albemarle County, Virginia. The Cold Coasts, A Cold War Caper in the High Arctic. Describing his field assignment aboard a “spy ship” in Svalbard. Working Class Hero, One Life in a Stalwart Generation, 1884-1954. About the life and times of his father. Once Upon a Blog. Contents of the Blog “Jim’s Observations” from August 2013 to September 2014. Vietnam ‘66, A Personal Experience of the War. Describing a field study of Viet Cong tunnels and their geologic settings. Enamel Art, An Appreciation. Describing an art form, not widely known, that for over three thousand years has produced diverse objects of brilliance, beauty, and remarkable durability. The purpose of his blog is to share with interested persons the recollections and adventures of a long and varied career, and to express some of the opinions developed along the way. To see contents of the blog, and for easy access to specific postings, click on Detailed Contents. I recommended The Cold Coasts to an email group who travel the world chasing solar eclipses. Many of them went to Svalbard recently (20 March 2015) to watch a total solar eclipse from there. I hope some will enjoy your book, to have some background of a cool place they visited, many for only a day or two. Two questions for you: have you ever watched a total solar eclipse, and are you intending to watch the total solar eclipse in 2017 (the path of totality runs all the way from Oregon to S. Carolina)? I live in Oregon near an enormous basalt prominence called Cape Foulweather. Thank you for your interest. No, I never saw a total solar eclipse, despite an early interest in astronomy and lifelong hopes that I might see one. And now, at an advanced age, I’m not making plans for 2017. It would depend on how near it came to where I might be at that time. Dr. Burns – I came across your blog when I was researching Dorothy Clark, who I knew when I was on the RAC staff in Saigon. I was there (with my bride) from August 1962 to September 1964, working for Charlie Warner, who was in Bangkok. I recall another geologist at RAC, David Doan(?) visiting us but I gather that you arrived sometime after we left. I would be delighted to hear from you so we can compare notes. Delighted to hear from you. You’re correct about dates — I was with RAC from 1966 to 1968. I knew David Doan well. He was the first of about 6 or 7 geologists who moved from the Military Geology Branch, U.S. Geological Survey, to RAC. As the blog indicates, I was one of that group also. While there I had two major field assignments, in Iran and Vietnam, both of them dealt with in the Blog. RAC underwent a series of cutbacks starting in 1968, finally closing down somewhere around 1974. In 1968 I retreated to the Civil Service, where I spent the rest of my career — first in the Army Combat Developments Command, then the Army Corps of Engineers, and finally in 1975 back to the Geological Survey. Thinking further about this, I think that Bob Ryan, who was in Saigon with me (he and I were the original RAC staff there) was originally a geologist. I visited with him a few years ago on the Eastern shore, before his wife Nancy died. I don’t know if you overlapped with him at all. Dorothy Clark spent some time in the Saigon office during my tour – she was a wonderful person. I believe that she did the original work on what became the Hamlet Evaluation System – are you aware of that activity? I’ve just learned that a Cornell student of mine in the early 70’s actually wrote a student paper on the system, and that some of the original documents somehow ended up in the Cornell archives. William Prince of Bendix seems to have picked up the work, and I think he must have had a Cornell connection. Yes, I remember Bob Ryan as being a fellow geologist. Didn’t know him well — from different pre-RAC backgrounds, and always working in different parts of the RAC operation. But we met a few times, had lots of phone conversations, I believe mostly about trying to keep some RAC projects alive during the period of cutbacks. The name Nancy rings a bell. I recall and can picture clearly a Nancy Girard in Military Geology Branch. When she left, I think a change of name to Ryan was involved. I don’t recall that Dorothy discussed her work with me — “need to know” was a criterion she observed. But I do remember charts on the office walls showing statistics on numbers of hamlets in each of several stages of pacification. I am pretty sure that Nancy Ryan’s maiden name was Girard. Not certain how I know that. I’m currently working on a book about Svalbard’s political history. I would very much like to use a couple of photos that appear in your work. Could you please e-mail me (you dont’s seem to have provided contatct details on your web site). Thanks. I’m sending you an email separately, as you requested. Please let me know which photos you are interested in. Five of them were used with permission from other sources (see last paragraph on page 8). All the rest are my own, and I would be pleased to let you use these, requesting only that you give credit to my book as the source. Best wishes.